So here are some things I knitted. Wait, let's go back a step. So here is some loot from the 2009 Maryland Sheep and Wool Festival. It's Maple Creek Farms Flagstaff, a 50% merino / 50% silk aran to bulky weight yarn. 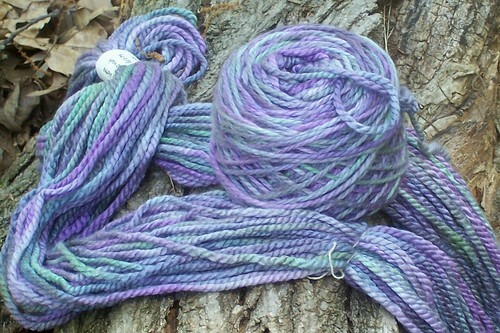 The colourway is 'Mystic Forest,' and is a marvelous blend of greens, blues and violets. I bought two skeins, which came in at about 240 yards. Not a lot of yarn, but enough, I said at the time, to make a hat or some mittens. For some reason, I always say that, despite the fact that I don't go through mittens fast enough to warrant making more than one pair every five years, and most knit hats look terrible on me. Then, having bought it, I let the yarn sit for, well, four years. It's all one thing to say you'll make a hat or some mittens, and entirely another to find a pattern to go with the yarn. This is especially challenging when you don't need that many mittens and most knitted hats look terrible on you. In addition to that, I wanted to find a pattern that would use up most, if not all, of the yarn. I rarely knit with bulky weight yarns, and I didn't want to be left with half a skein that would never find its way into another project. And so the yarn waited. I looked for patterns for it occasionally, and even thought about doodling up something myself, but never came up with anything until this pattern, Sprouting, by Traci Heiner, showed up in a Ravelry pattern search. I liked the leafy lace, I liked the snug little cowl, and I really liked that it called for about 200 yards of yarn. I'd have some leftover, but not so much that I'd feel guilty about it sitting around in my stash. The cowl was knit according to the pattern and fits perfectly, but when I started the mitts on the same needles I found them a little too loose, so I went down two needle sizes. I also prefer a longer cuff, and added a couple of repeats there. And yet, when I got the cowl and the first mitt out of one skein of yarn (with about 3.5 yards to spare), it was clear that I was going to be stuck with quite a bit of leftover yarn. Thus the headband developed. It's the first half of the cowl pattern, worked over a smaller number of stitches so it fits snugly. To keep it symmetrical, I cast on with a provisional cast-on, knit the headband, cast off, and then unzipped the provisional cast-on, picked up the live stitches, and cast them off immediately. Full details in my Ravelry notebook for curious knitters. How much did I have left over? About 40 yards. Not bad.